Drake described him as "a man of respect and a don", while Rihanna wrote on Twitter: "This doesn't make any sense! My spirit is shaken by this!" The musician died as a result of gunshot wounds to the head and torso, the Los Angeles County coroner said on Monday, ruling the death a homicide. Nipsey Hussle's debut album Victory Lap received a nomination for best rap album at this year's Grammy Awards, where he was nominated against Cardi B, Mac Miller, Pusha T and Travis Scott. Writing on Instagram, Pusha called him a "rare breed" adding: "Sad to see you go Nip, I'm only finding peace in knowing you are blessed... I was honoured to share in such an amazing year with you musically. "I would gauge everyone's music credibility based on if they mentioned you." "My whole energy is just at a low right now hearing this," he wrote. "We just linked for the first time in years and said we were gonna do a new song this summer cause it had been too long. "You were having the best run and I was so happy watching from distance fam nobody ever talks down on your name you were a real one to your people and to the rest of us." The Mayor of Los Angeles, Eric Garcetti, said Hussle's death was an "awful tragedy" while Atlantic Records added (below): "Words can not express our sadness. 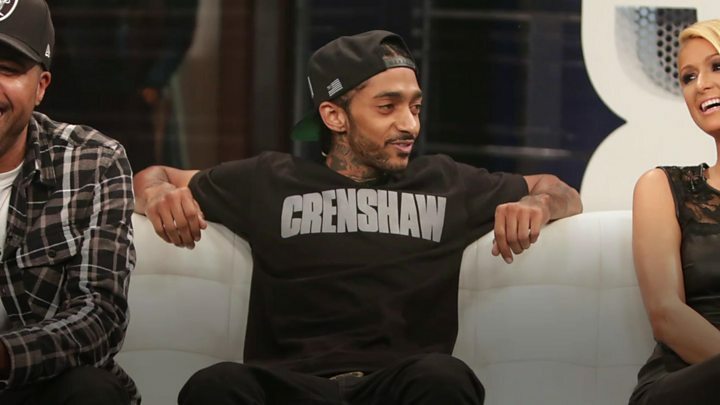 Nipsey was not only one of the greatest artists we worked with but an amazing father & leader in his community." Hussle, real name Ermias Asghedom, grew up in south Los Angeles and was a member of the Rollin' 60s street gang as a teenager. Famously, he sold 1,000 copies of his 2013 Crenshaw mixtape for $100 - even persuading Jay-Z to buy 100 copies - giving him the financial security he needed to pursue music on his own terms. That music was heavily indebted to the West Coast rap he grew up with in the Crenshaw neighbourhood of Los Angeles, from where he embarked on his journey from the streets to the major league. Hussle never hid the fact he'd been a long-time member of LA's notorious Rollin' 60s Crips, but his croaky-voiced raps about shoot-outs and drug deals were always haunted by the ghosts of those who got left behind. On one of Victory Lap's stand-out tracks, Dedication, Kendrick Lamar urged people to look beyond Hussle's gang days, stressing: "He a man first, you hear the words out his lips/about flourishing from the streets to black businesses?" It was a perfect encapsulation of the musician's mission statement. "Me being a human comes before me being an artist," he told Billboard last year. "I want to affect change and I want to impact the communities that I grew up in, and the ones like it." Paying his own tribute, hip hop mogul Diddy said Nipsey "represents change, he represents evolution, he represents everything our culture needs to embrace".